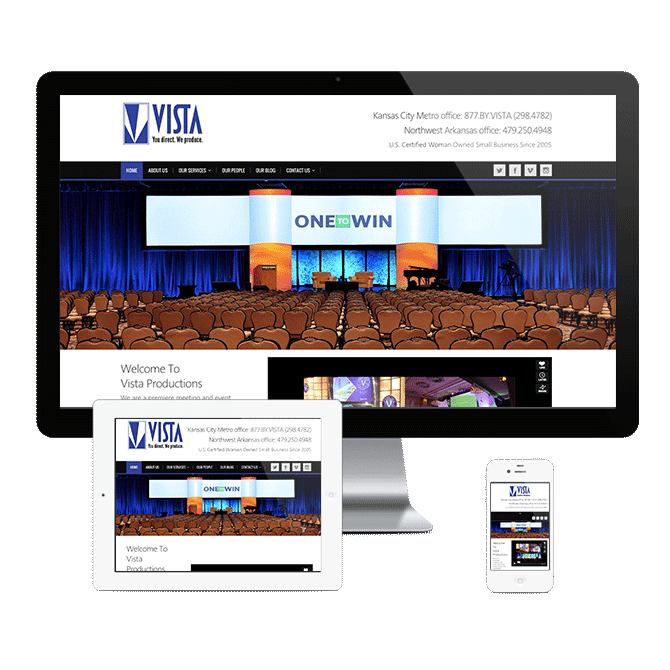 Kansas City based Vista Productions was in need a website redesign incorporating new technology that would allow their site to be viewed optimally across multiple devices and platforms. I began the website redesign by incorporating a lot of the content from the previous website, but regrouping their business to business services into four clearly defined areas, allowing us to showcase each service with a gallery of images as well as a paragraph or two of keyword rich content. Displaying the content in this way allowed us to maintain a clean and minimal design while at the same time keeping the focus on their services and content. Once we clearly defined and showcased their content, the website redesign shifted, focusing on making the website responsive across multiple device sizes and screen resolutions. This way Vista could look their best on the web whether a user in Kansas City was viewing it on a computer or someone in Bentonville was looking at it on a phone.